Our Mission: Information Technology (IT) supports academic and operational excellence by empowering people and processes with transformative technology that ensures student success regardless of race, class, or identity. The Information Technology Department seeks to provide best-in-class IT products and services to the District while enabling customers with the most efficient and appropriate technologies available. To inform PPS staff that PPS Chromebooks and computers using the Chrome browser will display a new “Gopher Buddy” icon in the toolbar. The PPS Information Technology Department is using the Gopher Buddy browser software extension to identify Chromebook distribution by locations. The icon appears in Chrome browsers on other types of computers, however it does not perform any function on those computers. The Chromebook location information will improve our technology inventory data for planning and ongoing support. You or your students may notice the “Gopher Buddy” icon in your Chromebook or Chrome browser toolbar. You will not notice any performance impact and only location data is being reported. Please contact IT Support using the Support portal at support.pps.net, by emailing support@pps.net, or by calling x63375 with any problems or questions you may have. To notify PPS employees of a new Support Portal that will be available on Monday, March 4, 2019. This new service platform will help improve communication, transparency, and efficiency for technology support throughout the district, replacing the former IT Self-Service tool. Access the new Support Portal at support.pps.net and log in with your PPS email address and password. Please note that all of your active IT Self-Service support tickets will be copied over to the new platform. Please contact Technology Support at support.pps.net, support@pps.net, or x63375 with any problems or questions you might have. The PPS Technology Department is working to make sure that District Chromebooks and Chromeboxes are updated to the current version of Chrome OS to be ready for instruction and spring assessments. While most Chrome devices are now up to date, there are currently a large number of Chrome devices in our inventory records that are outdated and not showing active use. Beginning on March 22, 2019, Chromebooks and Chromeboxes that have not “checked in” to the PPS network within the previous four months will be marked as inactive and will no longer be able to log in. Removing inactive devices from the network will improve processing times and security updates for the rest of our Chrome devices and also free up licenses that can be used for new purchases and donations. If you have any Chromebooks/Chromeboxes that may not have been used recently, please power them on and log in to make sure they are updated. After March 22, 2019, any devices that have not been used within the previous four months will be flagged as inactive. If you then try to log into an inactive device, you will see a message stating, “This device has been reported Lost or Stolen. Please return to PPS IT”. If this occurs, please contact the IT Service Desk to have the device re-enabled. Please contact the IT Service Desk at support.pps.net, itservicedesk@pps.net, or x63375 with any problems or questions you might have. In response to recent phishing attacks, the PPS IT Department has added a tool to your Outlook email application in order to help make reporting phishing email attempts quick and easy. The “Report Phishing” button is available in Outlook -- Desktop, Web Client and Mobile App. 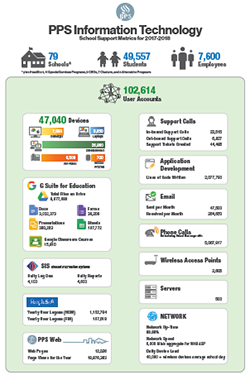 Check out the PPS IT school support metrics for last year on this infographic. School administrators were surveyed in June, 2018 to report their satisfaction with IT Department service levels at their school and what improvements are needed. Of 42 responses received, 80% were mostly satisfied with the remote and onsite support that they received during the 2017-18 school year. 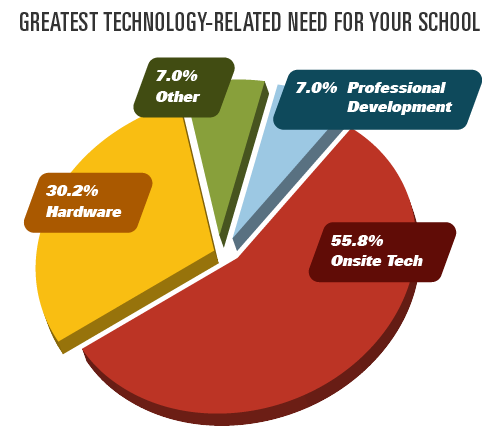 When asked about technology improvements needed at their school, most administrators identified the need for site-based classroom technology support, more Chromebooks for students , new Chromebooks for teachers, Chromebook and other technology repairs, disposition of obsolete technology, and asset inventory tracking and reports. Also noted was the need for new copier/printers (which have now been deployed) and IT support for CUB events. We appreciate hearing from our school administrators as we work to improve service levels. As always, please use itfeedback@pps.net to share your comments at anytime.